Marc Gasol and Mike Conley were able to play their last game in Memphis, a game that escaped them in the worst way: they were winning by 25. Memphis Grizzlies is a spoiled team. The reason is not understood very well, since the project is in full reconstruction but there is a clear improvement of both prestaciones and tools of last season to this one. But now it seems the end. 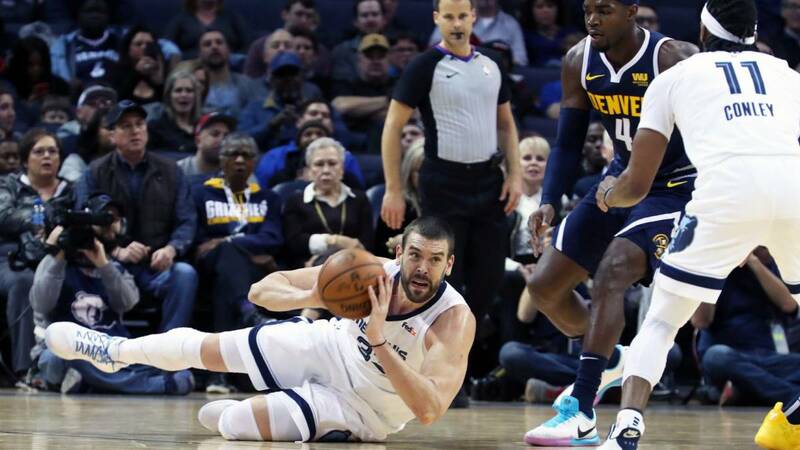 Marc Gasol and Mike Conley have entered fully into the transfer talks, their streak is horrendous in the last month and they allow themselves the luxury of losing matches like today against Nuggets. Ganning by 25 points (70-45, minute 31), but not like that. They threw the advantage by pure pasotismo, they had the party really controlled and were deranging the Nuggets, to whom the match fell from the sky. Conley did a great match. Not only for the 23 points and 11 assists that he accredited, which is what you see at first glance: his mastery of the situations in attack, especially in static, was total until the comeback of Denver, Harris went nuts, Barton and Morris. Mike Malone's team only left the cave from time to time to launch some profitable counter, but little more. The first part also served to see good cuts by the center of Noah, hit in several positions of Holiday and defensive actions of Jackson. And Marc Gasol, a lot Marc Gasol: the Spaniard finished with 28 points and 9 rebounds, with a great job going from the outside in and distributing balls. A The Grizzlies were seen fried in the last quarter. They played with eight in the rotation, the ninth (Ivan Rabb) only played five minutes, and the partial in the final period was 15-35. The Nuggets broke based on counterattacks and rapid transitions, although it was with two triples, one from Beasley and another from Barton, which ended and finished ahead. Justin Holiday put another shot of three inside (92-91) and Jokic scored with half a minute shot before Marc Gasol (92-93), but the worst was yet to come: an action by Kyle Anderson in which he fined twice to fail, he took the offensive rebound in five meters and hesitated twice to throw without touching a rim and throw again while he was stepping on the baseline, a nonsense that led to the Colorado to beat by 92-95. The Grizzlies are now starting a tour outside their pavilion. On February 6 return, just one day before the closing of the transfer market in which Marc Gasol could be involved. If this is the end, it is horrendous.